The cariole is a sleigh made from wooden planks of oak held together with sinew lashing. The back and the sides are made from panels of rawhide that have been painted green. The interior is lined with green velveteen cloth. In this example, the letters “HBC” and the HBC coat of arms are painted in white on to the left-hand side of the cariole. 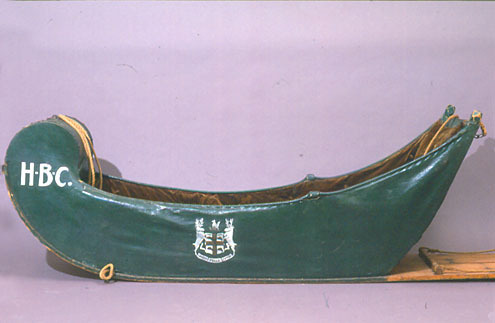 During the fur trade era, the term “cariole” became more commonly used for a toboggan-like sled with sides made from hide or canvas. Birch boards were often used for the toboggan planking. Pulled by a dog team, the cariole transported a passenger or cargo. A dog team driver would run along behind the cariole sled while it was under way shouting commands to the dogs to guide their pace and direction of movement. Trappers and traders used the cariole throughout the winter months to transport supplies and furs. Some carioles, especially those used to transport dignitaries or celebrants of special occasions such as weddings, were decorated with painted designs. This one is a more elaborate version that was made by Charles Cuthbert Sinclair, a Chief Accountant at Norway House. It is a duplicate of one that was constructed for presentation to Countess Grey, the wife of Earl Grey, the Governor General of Canada (1904-1911). The Greys had travelled to Norway House from Ottawa in 1910.